Space is a luxury in Bangkok and while you can get a large room at a 5 star hotel you'll have some troubles finding a Hotel in Bangkok that also offers a private pool. 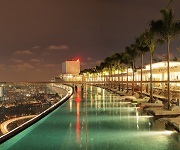 My friend was coming to Thailand and asked me the other day where can he get a hotel with a private pool in Bangkok? My mate likes things 5 stars so really there was only one place to send him, The Siam is actually one of the trendiest Chiq hotels in Bangkok in fact it even has it's own Private Muay Thai gym. These Bangkok Pool Villas are really something special but it's not likely many people are going to have the baht needed cover the cost of one night stay in their cheapest courtyard plunge pool. But for something special or for the wannabe rockstar this is one hotel in Bangkok that has everything including a private pool.